In 2015, I only rated 7 wines with 5 stars. There were many wines that came close to my idea of perfection in a glass, and many of these I gave 4.5 stars. These are amazing wines still and I highly recommend purchasing any of them. There are 77 wines that I classified as 4.5 stars. 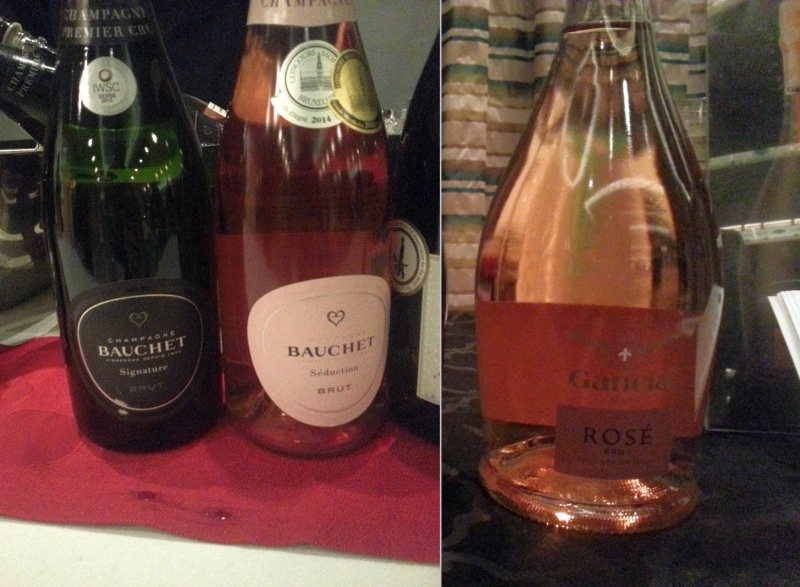 All of these wines are listed below by category: Dessert and Sparkling (14 wines), White (31 wines), and Red (32 wines). There are wines from around the world, with a significant number from BC, and at many different price points, so there should be something for everyone to enjoy. Happy Holidays! Champagne Bauchet Seduction Brut, NV, France ($55.99) – How can you pass up Champagne called “Seduction”? This one is a rose. It has a light bready nose. Dry, light body, with red fruit flavours like strawberries, followed by Delicious and McIntosh apples. Light bodied with very fine bubbles. Blue Grouse Estate Winery Paula 2012, BC – Medium pear juice colour in the glass. Lots of bubbles with froth effusively when first poured into your glass. Youthful, medium intensity nose with peaches, citrus, lees, and crisp apple aromas. It is dry, with medium bubbles and biting acidity that is followed by a creamy mouth feel, and then a hint of salty minerality in the back. Citrus, pears, apples, floral notes, and nuttiness on the palate. Medium length with some bitterness and lees on the finish. Laurent-Perrier Rose, NV, France – This bubble is made with 100% Pinot Noir grapes from Grand Cru vineyards. Light toast and red fruit aromas. Medium body, dry with a creamy bubble. Red fruits and sour red cherry flavours. Monte del Fra Scianco Spumante Brut Custoza, Italy (~$24) – Nice ripe candied pear aroma, which continues to the palate. Medium body with small bubble, soft mouth feel. Very tasty at a nice price. Nicolas Feuillatte Brut Rose, NV, France ($64.99) – Light strawberry nose. Light body, round mouth feel, with creamy medium-sized bubbles. Red cherries and red fruit on the palate. Giulio Ferrari Riserva del Fondatore 2002, Italy ($82.12+tax) – Toast and apple on the nose. Dry with very high acidity. Small bubbles. You first get apples on the palate followed by toastiness. A complex, quality Prosecco. 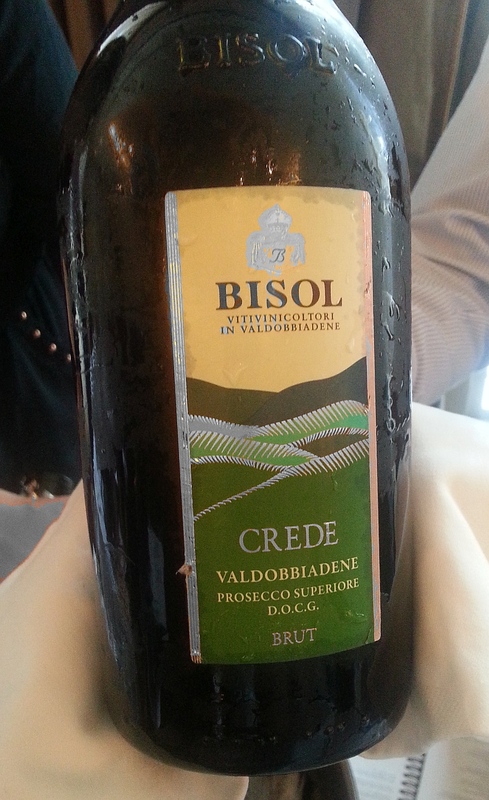 Bisol Crede Valdobbiadene Prosecco Superiore DOCG Spumante Brut 2014, Veneto, Italy – Crede is Italian for “clay”, the soil where the Glera grapes are grown for this Prosecco. Light stone fruit nose. Dry, medium body with high acidity. Citrus and stone fruit flavours followed by flowers on the finish. Charles Heidsieck Brut Reserve NV, France ($60.99) – Light apples and toast notes on the nose. Light body with very tiny bubbles. Nutty, lemon and apples share equal stage in your mouth, followed by tasty creme brulee flavour. A really nice Champagne. Charles Heidsieck Brut Cuvee NV, France ($57.99) – Light toasty citrus and apple aromas in the glass. Medium body, dry with tiny bubbles. Mainly nutty flavour followed by apples later. Very good. Moet & Chandon Grand Vintage 2006, France ($73.99) – This is a named vintage Champagne, which is only produced in great years when the grapes reach full flavour complexity. Light toasty nose that continues to the palate. Dry with fine bubble; citrus followed by nuttiness on the mid-palate. A bit of a splurge, but well worth it. Recline Ridge Hummingbird’s Kiss 2014, BC – This late harvest wine is a blend of primarily Optima grapes and a little bit of Bacchus. It is bursting full of ripe peaches on the nose and in your mouth. Off dry with medium acidity, with a round, light syrupy feel. The acidity dries up the wine on the finish. Very tasty. Arrowleaf Cellars Select Late Harvest Vidal, BC ($21.70+tax, 375ml bottle) – Light greenish yellow in colour. Lemon, honey, pine needle and lychee aromas. Medium sweetness, medium body, with higher acidity. Honey, marmalade and orange rind on the palate. I tend to prefer Riesling over Vidal for Late Harvest or Ice Wines, due to Riesling’s higher acidity making the wine less sweet and cloying, but I must admit that I really loved the higher acidity of this Vidal and how it kept the wine exciting to sip. Harpers Trail Thadd Springs Vineyard Late Harvest Riesling 2013, BC ($20.90). It doesn’t state that it comes from one block or the other, so I assume it comes from both blocks. Fairly pale lemon coloured in the glass. A very nice medium intensity nose, with honey, marmalade, sweet spices, apricots and oranges. Nice to nose. Sweetness ranges between medium-dry to medium. A bit lighter bodied, but very full, intense flavours, primarily of ripe apricots, but also some Indian mango, and a hint of orange, which comes in after a bit of swirling. The sweetness is upfront on the tongue together with a light acidic prickle. Honey and marmalade on the finish, with medium acidity. I enjoyed that the wine was not cloying sweet. Elegant. I did try this wine a few hours later, and the wine had a much lighter mouth feel after a quick swirl in the mouth, which was nice, as it added to the lightness of the wine. Audrey et Chrstian Binner Riesling, 2012 Alsace, France – Deep pear skin colour. Lots of honey, dried stone fruits and nuttiness on the nose. Medium body with a buttery mouth feel. Medium acidic prickle on the tongue. Flavours of honey, ripe pears and other stone fruits, together with some spiciness on the tongue, minerality and nuttiness. This is an excellent wine. Burrowing Owl Sauvignon Blanc 2014, BC – Medium lemon green colour in the glass. A very intense, rich nose with aromas of honey, pineapple, passionfruit and green fruit. Dry but very round and mouthfilling. Intense honey, tropical fruit, and dried fruit flavours, with sweet spices in the mid palate. Some pepper and lees also. With decanting you also get pine needles and passion fruit flavours. Medium plus to long length. An excellent wine that you might not recognize as Sauvignon Blanc at first sip. Serendipity Winery Viognier 2013, BC ($20) – Pale lemon in colour. Medium intensity, interesting, developing aromas, with Bergamont, steeped tea leaves (some may say ganja), ripe apples, and hints of flint and mandarin orange. Dry with above average acidity, body, and flavour intensity on the palate. Starts with peach and apple, followed by mandarin orange and tea leaves on the mid palate. With decanting the mandarin orange becomes more prominent. Medium length leading to mouth watering acidity on the finish. With decanting, you get more peach and some bitterness on the finish. I really like this wine. Blue Grouse Estate Winery Bacchus 2014, BC ($20) – Bacchus is a cross of Silvaner x Riesling with Müller-Thurgau. Its name is taken from Roman name of the Greek wine god Dionysus. I was surprised to read that their Bacchus grapes are grown on 20-year-old, self rooted vines on Vancouver Island! Pale lemon green in colour, with medium intensity aromas of citrus, waxiness, and green fruit. Dry, round, with above average acidity. Medium bodied. Very citrusy with nice pine needle and green fruit backbone. There are also hints of apricot and peach flavour. I also pick up some stoniness on the palate. Mouth watering acidity on the finish with citrus rind, citrus and pine needle flavours continuing from the start. Laughing Stock Amphora Wine 2014, BC – Two Rhone grapes, Viognier and Roussanne, were used to produce this wine. They were fermented in terracotta clay Amphorae, and of course used wild fermentation. Sweet spices, flowers and lychee aromas in the glass. Dry, medium minus body, soft with lower acidity on the palate. Light intensity flavours of baby powder, stone fruit and sweet spice, followed with some light tannins and pepperiness on the finish. 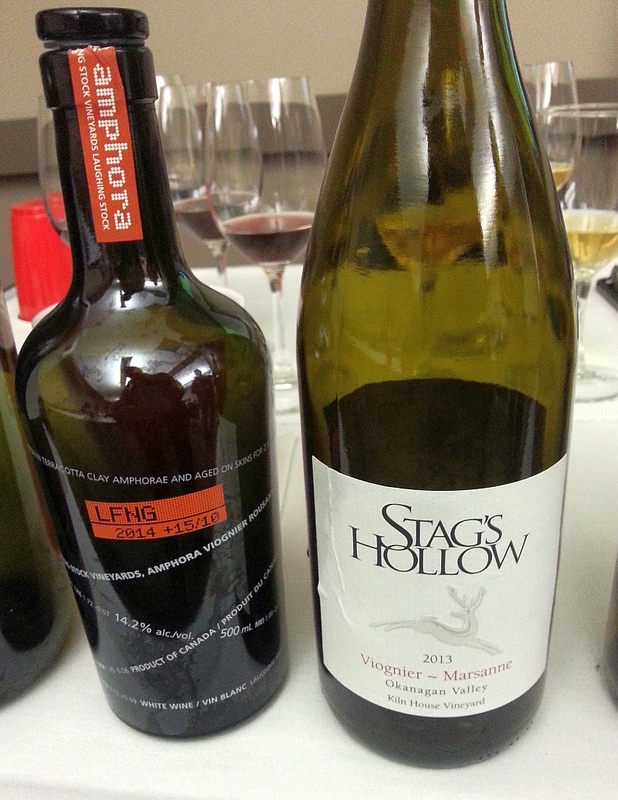 Stag’s Hollow Kiln House Vineyard Viognier ~ Marsanne, 2013, BC – Another white Rhone blend! This one has a deep pear skin colour in the glass. The deeper colour that you get in natural white wines comes from the skin contact from the white grapes with the must. For conventional white wines, the grapes are pressed and the juice immediately separated from the skins. Nice nose, with aromas of lychee, honey and a hint of acacia (which to me has a bit of a spearmint aroma). Fuller bodied, dry with flavours of peaches and pears and another hint of acacia. Smooth and round, but has a medium level of tannins on the finish. Sperling Vineyards Old Vines Riesling 2014, BC – Pale straw in colour. Medium intensity nose with light mandarin orange, citrus, apple, lemon rind and a hint of lees. Off-dry, medium body, with medium plus, nervy acidity. Crisp ambrosia apple with lesser amounts of stone fruits, particularly peach, and flowers, followed by lemon flavour. Mineral. Medium length with mouth watering acidity on the end and finishes with the crisp apple again. A very nice wine that I’m sure will build some interesting character with time in the bottle. Try again in 2-3 years. Sperling Vineyards Old Vines Riesling 2013, BC – Medium lemon colour. Peaches, apples, with hints of lees and white flowers. With some decanting you get a hint of petrol and honey as well. Off-dry, medium plus body and intensity of flavour. Round and heavier mouth feel with a slight acidic prickle on your tongue. Honeysuckle, ripe pears, overripe apricots and a hint of petrol on the palate. With decanting the petrol and apricot flavours lessen. A bit peppery on the finish together with mouth watering acidity. An excellent, complex wine. 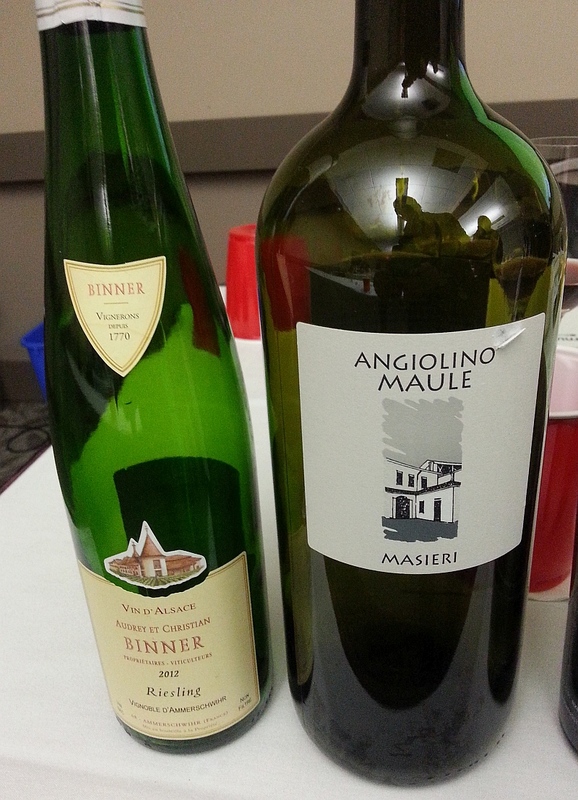 Acidity balances with the developing fruit flavours. ATS Wine Sicily Terre Siciliane IGP Vino Lauria Grillo Gardinello 2014, Sicilia, Italy – A wine made with 100% Grillo grapes. A nice nose with aromas of honeysuckle and ripe stone fruits. Medium minus body, dry with medium acid. Ripe pears and nettles/herbal quality. Honeysuckle on mid palate, and spiciness on the finish. (Not yet in BC/AB). Castelfeder Alto Adige DOC Pinot Grigio “15” 2014, Trentino Alto Adige, Italy – This is 100% Pinot Grigio, coming from the northern reaches of Italy, bordering with Switzerland and Germany, which can explain the German sounding name of this winery. It has a light peach nose. Dry, medium body and soft, with a slightly viscous feel. The peach flavour builds to the finish. Domodimonti Societa Agricola Licoste Offida DOCG Pecorino 2014, Marche, Italy – 100% Pecorino grapes in this wine. Ripe pears and apples on the nose. Full bodied, tropical fruit and oak on the palate. Round. A big wine! Kalala Organic Estate Winery Dostana Riesling 2011, BC – Deep gold colour in the glass. Pronounced developing aromas of petrol, dried apricots, honey, very ripe pears and brown butter. Dry, very round and soft, but quite mouth filling. Thickness on the palate. The dried apricots and brown butter carries across to the palate, along with pears and baked apples. Medium plus length. Silky finish, some acidity but not mouth watering, and a sort of a woody component. Very high quality. Synchromesh Storm Haven Vineyard Riesling 2014, BC – Between pale and medium straw coloured. Medium intensity nose with aromas of flowers, honey suckle citrus and peaches. Medium-dry this wine has a very salty, mineral flavour and a viscous feel on the tongue. Higher acidic prickle on the tongue as well. Flavours of peach, apricot, followed by apple, then floral, and finally citrus. Honey suckle throughout, with hints of lime and petrol. Medium length. Very citrusy finish. This wine has everything to make it outstanding: acidity, fruit, minerality and sugar. Summerhill Pyramid Organic Winery Organic Riesling 2013, BC – Medium lemon in colour with a clean, youthful nose of citrus, honeydew melon, stone fruit and apples. With a very low alcohol content at 8.6%. this leaves a bit of residual sugar, and gives you a medium-dry wine. This wine has medium plus acidity which helps to balance out the extra sweetness. I really liked the flavours in this wine of green apple, pear and a hint of lime and honey. The apple and pear flavours in particular didn’t fade and stretched from first touching your lips till you swallowed. I also noted a bit of mineral backbone in this wine. It finishes off dry with green apple. You don’t notice the higher acidity till the finish, due to the medium sweetness of the wine. It was overall quite soft and round in your mouth and made a very pleasant wine to drink. Ex Nihilo Vineyards Riesling 2013, BC – Medium straw colour. Youthful nose, medium intensity with aromas of ripe stone fruit, McIntosh apples, and a hint of petrol. The petrol became more pronounced with decanting. It is dry, fuller mouth feel, round and soft. It has medium plus acidity and flavour intensity. You get pears, green fruit and other stone fruit with a hint of petrol, and bruised apples on the mid palate, and minerality on the finish. It has a more austere finish with mouth watering acidity, lime skin and ripe apple flavours. A complex wine. Poderi Dal Nespoli Nespolino Bianco 2014, Italy (SPEC $8.99) – If you can buy this wine, don’t hesitate. It is a blend of Trebbiano and Chardonnay. It has a light apple and oak nose. Dry, medium body and soft with a mineral streak through it. Ripe pears, and apples with citrus and a hint of flowers. Tasty. Baille-Grohman Estate Winery Chardonnay 2012, BC – Nice citrus and tropical fruit nose. Medium body, dry with light oak treatment. Mineral with light tropical fruit and sweet spice on the palate. Mouth watering acidity on the finish. Very tasty. CedarCreek Estate Winery Platinum Viognier 2014, BC – Medium intensity stone fruit, flowers, and spice on the nose. Medium body, soft and round in the mouth. Velvety. Ripe stone fruit and sweet spices. Staglin Family Vineyard Estate Chardonnay 2010, California (SPEC $79.99) – Ripe tropical fruit and vanilla aromas in the glass. Medium body, round with a heavier mouthfeel. Tropical fruit, oak and sweet spices. A wine of very good quality, but you must like oak and spice in your Chardonnay. J Moreau et Fils Chablis 2013, France (SPEC, $23.49) – Very nice honey and white flowers, and stone fruit aromas. Medium minus body, dry and soft, with flavours of apples and apricot. Smooth. Delicious. And has a mineral streak. Impress your friends with this wine at a great price. Kuhlmann-Platz Gewurztraminer 2014, France ($16.49) – Nice aromas of roses and lychee. Light body, off-dry with apples, lychee, honey, apricots, and a herbal note. Very nice. 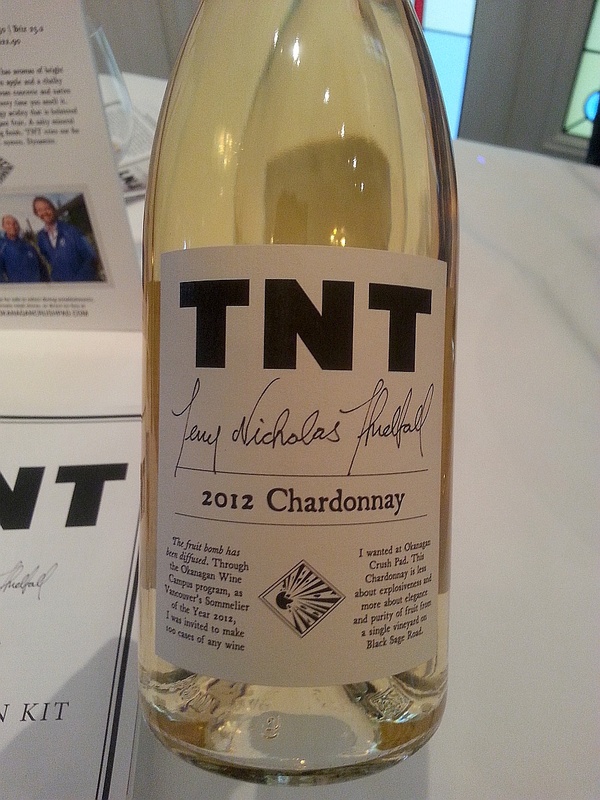 TNT Chardonnay 2012, BC – Light smoke and apple aromas in the glass. Medium body, with a light flint / mineral component. Round with light flavours of red apple and butterscotch. Mouth watering acidity on the finish. Browne Family Vineyards Chardonnay 2013, Washington – Pale lemon in colour. Lots of tropical fruit, vanilla and butterscotch on the nose. Medium minus body, soft, with a light mouthfeel. Medium minus intensity with tropical fruit and butterscotch flavour followed up with minerality and spice. Very elegant. Chateau Rollat Ardenvoir Chardonnay 2009, Washington – This Chardonnay is made with all French oak, of which 10% are new barrels. Deeper pear skin colour with legs evident in the glass. Light tropical fruit and oak on the nose. Soft, silky, butteriness on the palate with tropical fruit and light oak flavours. Very good quality. SpierHead Riesling, 2014, BC ($19) – Medium lemon with a greenish tinge in the glass. Youthful aromas of lemons, a hint of oranges and white flowers, followed by honey and lime. Slightly off-dry , with medium acidity leaving a light acidic prickle on the tongue. Soft with an acidic edge. You first get tropical fruit on the palate, followed by ripe stone fruit, and a hint of lime rind. After decanting a few hours, the wine became much more round, and less crisp, except on the finish. It does finish with mouth watering acidity, citrus flavour and on Day 2 of my tasting, some citrus rind. The flavours progress tropical fruit – stone fruit – citrus on the palate. You also get some stony minerality on this wine, which is a little more obvious on Day 2. Don’t be afraid to linger over this wine for a few days. It is very good. Buy some take-out sushi and enjoy it on your deck with this wine. Hunter’s Riesling Marlborough 2014, New Zealand ($25.99) – Mandarin orange and stone fruit nose. Dry, medium body, mineral with the full range of citrus, tropical and stone fruit flavours. I really liked this wine. The minerality is a nice complement to the fruit. Harry McWatters Collection Chardonnay 2013, BC (BC $24.99) – Picking of the grapes for this wine began on September 30th for their Chardonnay Clone 76. On October 2, their Chardonnay Clone 96 was harvested. (I am not sure of the clonal selection for the TIME Estate Winery grapes.) The wine is medium lemon colour in the glass. Nice nutmeg and vanilla scents, with light tropical fruit and stone fruit aromas. With some decanting, the oak in the wine became more evident. This wine is more restrained on the palate compared to the TIME Estate wine. It is medium body, round, and silky textured. Light nutmeg and tropical fruit flavours upon first sip, leading to a second layer of citrus. There is also a hint of honey also on the palate. Medium plus length. Mouth watering acidity on the finish and pronounced nutmeg. With decanting the wine became fruitier, smoother, and more inviting to sip. Also the acidity is more subdued with decanting. Buy a few bottles. Drink some now and maybe the rest in 1-2 years. Haywire Free Form Pinot Noir 2014, BC – Violets, fino sherry, raspberries, red cherries, and some sweetness on the nose. Lighter bodied, off-dry with a light mouth feel. Flowers, and bright astringent flavours of red cherries, raspberries and plums on the palate, with sour cherries on the finish. Burrowing Owl Merlot 2012, BC – Deep ruby in colour. More pronounced youthful aromas of cedar, oak, ripe cassis and black cherries, chocolate and vanilla. Very nice nose. It was dry with medium acidity, tannins, alcohol and body. Flavours of dark bitter chocolate, cassis, black cherries, blackberries, and plums, with oak and vanilla in the back to support the fruit. With decanting the cassis became more pronounced. Firmer tannins. Medium plus length, with sweet spices on the finish. There was sediment in the bottom of my glass, so if you want to avoid these bits, please decant ahead of time. A really nicely balanced wine. Can drink now, or cellar a few bottles and enjoy over the next few years. Blue Grouse Estate Winery Quill Red Wine 2013, BC ($19) – Only 320 cases of this wine are made, with grapes coming from Cowichan Valley and Oliver, BC. It is a blend of 44% Marchel Foch, 28% Merlot, and 28% Cabernet Franc. Deep ruby in colour with a solid core. A medium intensity, youthful nose, with aromas of cedar, red fruit, cherries and vanilla, and a hint of cinnamon. With decanting you get the addition of floral perfume. Dry, medium tannins and acidity and body, but pronounced flavours of sour red cherries (predominant), along with black fruit, raspberries, red cherries, plums and vanilla. There is also a hint of minerality and cinnamon. Toward the finish you get some blueberries and then finishes with roses and sour red cherries. On the finish, it is more acidity that you get than tannins, but that is quite good. I think that this is a wine that will surely age well with time. 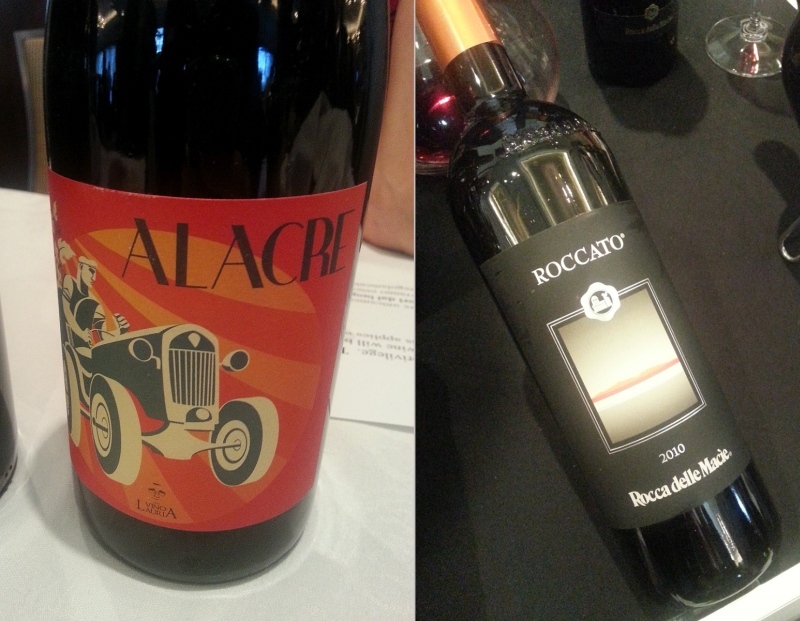 ATS Wine Sicily Terre Siciliane IGP Vino Lauria Alacre 2012, Sicilia, Italy – A blend of 95% Nero d’Avola and 5% Syrah. A closed nose, but dark fruit still noticeable. Medium plus body and acidity. Dry with ripe raspberry flavours followed up with spice. Soft tannins. Casale del Giglio Petit Verdot Lazio IGT 2013, Lazio, Italy – Ripe cherry and cranberry aromas. Fuller body, silky feeling, with ripe red fruit, some spice and woodiness. Castello di Gabbiano Toscana IGT Alleanza 2012, Toscana, Italy – Super ripe, almost port nose; Dark ripe fruit. Full body, ripe dark fruit with light oak treatment. Very intense flavours. Medium acidity with fine tannins. Casa E. di Mirafiore Barolo DOCG 2010, Piemonte, Italy – Nebbiolo is the grape of Piemonte and Barolo. Nice woody and red fruit aromas. Fuller body, dry with a light mouth feel. Red fruit, apples, and nutmeg. Nice. Castello di Gabbiano Toscana IGT Alleanza 2012, Toscana, Italy – A blend of 60% Merlot and 40% Cabernet Sauvignon. This wine has super ripe, almost a port nose; Dark ripe fruit. Full bodied with ripe dark fruit flavours that are very intense. Light oak treatment. Medium acidity and light tannins. Rocca Delle Macie Toscana IGT Roccato 2010, Toscana, Italy – A blend of 50% Sangiovese and 50% Cabernet Sauvignon. The wine has ripe cherries and vanilla on the nose. Fuller bodied, round and soft with medium plus acidity. Ripe plums, with light oak to support. Peppery finish. A nice balanced wine. Adega on 45th Estate Winery Cabernet Franc 2011, BC – An interesting nose, full of dark chocolate and ripe black cherries. Medium body, medium acidity, dry with flavours of red & black cherries, cedar and a hint of chocolate. Cassini Cellars Pinot Noir 2013, BC – Very pale garnet in colour. Violets, dried red cherries and tea leaves aromas. Light body, dry with sweet spices, tea leaves, cherries. Peppery finish, with fine tannins. Daydreamer Marcus Ansems Shiraz 2013, BC – Coffee and dark fruit aromas in the glass. I really liked the nose on this wine. Full body, with coffee, dark fruit, and nutmeg flavours. Dry with medium acidity and soft tannins. Gold Hill Winery Merlot 2012, BC – Ripe plums with a hint of capsicum on the nose. Medium plus body, dry with minerality. Ripe raspberries, red fruits, and plums. Very juicy ripe fruit flavours. Batasiolo Barolo Riserva DOCG 2006, Italy (SPEC, $43.49) – Medium garnet with orangey bricking in the glass. Bruised apples and dark cherry aromas. Medium body, dry with firmer tannins. Red cherries and apples on the palate. Tannins pick up on the finish. San Felice Brunello di Montalcino Campogiovanni 2010, Italy (SPEC, $60.89) – Ripe red and candied cherries aromas. Dry, medium body with firmer tannins. Ripe cherries up front with cedar in the background. Dry finish. Very good. Bodegas Borsao Tres Picos Garnacha 2012, Spain ($21.79) – One of my favourite wines I tasted at this event. It was medium translucent ruby in colour. Ripe cherry with a hint of matchstick on the nose. Dry, medium minus body, soft, with flavours of violets, red fruit, and nutmeg. Yum. It is not a heavy wine, so you can sip it on it’s own, or have with a slow cooked pork or lamb dish. 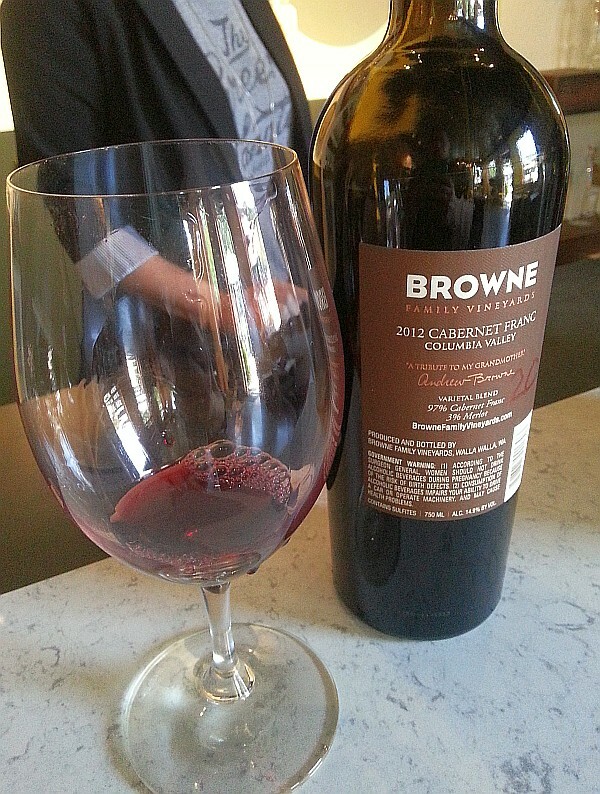 Browne Family Vineyards Cabernet Franc 2012, Washington – This wine has a small percentage (3%) of Merlot in it. Cabernet Franc is not very widely planted in the Walla Walla area. I read recently that there is only about 160 acres planted. A really nice nose, with aromas of dark chocolate, capsicum, cedar and dark fruit. Medium plus body, round and dry, with flavours of ripe cherries and cedar. A streak of minerality in this wine. Firmer tannins on the finish. Chateau Rollat Edouard de Rollat 2010, Washington – A Bordeaux blend with Cabernet Sauvignon, Merlot, Cabernet Franc, and Petit Verdot. Deeper garnet in colour. Light intensity nose, with dark fruit, sweet cherries, cassis and light vanilla aromas. Mineral! Fuller bodied, dry with fine tannins. Flavours of ripe, dark cherries, plums and has vanilla supporting behind the fruit. Dry finish, with the cherries coming to the fore again. A quality wine. Mark Ryan Winery The Shift 2013, Washington – A blend of 95% Syrah and 5% Grenache. Medium ruby in colour. Light meaty, vanilla, cassis and blueberry aromas. Full body, round and silky with ripe black fruits, light vanilla and some tarriness. Sour red cherries and blueberries show up on the mid-palate to the finish. Mark Ryan Winery Numbskull 2012, Washington – 58% Syrah, 26% Grenache, and 16% Mourvedre make the blend of this wine. I’m not sure why this wine is named numbskull, but I think it may have something to do with motorcycle culture, which is in evidence wherever you look in the tasting room. This particular bottle is graced with drawings of skulls on the label. Deep garnet in the glass. Smoky, coffee, dark fruit and vanilla nose. Salty minerality, fuller bodied with flavours of flowers, purple fruit and vanilla. Dry but with silky tannins. A really cool wine. Henry Earl Estates Merlot 2011, Washington – Lots of cedary, oaky notes on the nose, together with cassis fruits. Dry, medium plus body, with flavours of purple fruit, cherries and vanilla. Very fruity. After the fruit, you get sweet spices. Heavier mouth feel. Some chocolate later on. Medium acidity gives a nice backbone to complement the tannins. Henry Earl Estates Reserve Cabernet Sauvignon 2010, Washington – Medium minus garnet in colour, translucent to the core. An interesting nose; meaty with cocoa and dark fruit. Full body, firm tannins, with juicy black fruit, blueberries and cassis. Long length. Sonoran Estate Winery Jazz Series Malbec 2008, BC ($28) – Lots of red and black cherry, cedar, and vanilla on the nose. Very aromatic! Lighter body, higher acid, with puckering sour cherry flavour, followed with cedar and oak. This wine needs aging, maybe 4-5 years, and will reward you for the wait. 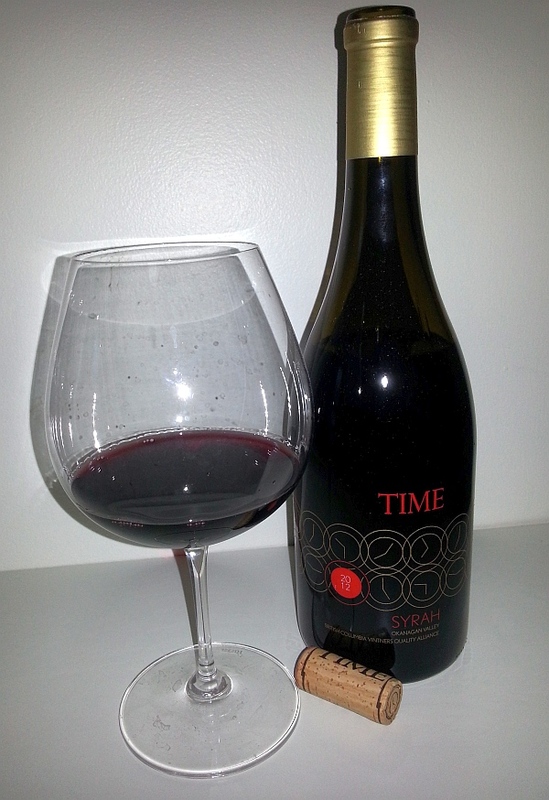 TIME Estate Syrah 2012, BC – This is a big, juicy wine. Deep to opaque ruby in the glass. Pronounced nose with cassis, dark fruit, leather, blueberries, sweet spices and chocolate aromas. On the palate you get a full bodied, round wine that is very silky. Lots of ripe cassis, followed with ripe raspberries, blueberries and blackberries. Hints of sweet spices. The tannins are quite fine for this wine. It ends with vanilla and a lot of pepperiness. A really vibrant wine. You can tell that it feels like it comes from a hot region. It does in fact come from Harry McWatter’s Sundial Vineyard on the acclaimed Black Sage Bench in the South Okanagan. Time Estate Meritage 2012, BC ($29.99) – A blend of 60% Merlot, 29% Cabernet Sauvignon, and 11% Cabernet Franc. Upon first opening it has a really inviting nose, with aromas of juicy cassis, red berries, vanilla, sweet spice, smoke and some meatiness, which I really like. I don’t recommend decanting this wine at all as you lose some of the vanilla, smoke and meat aromas. The wine is dry with medium body/acidity/tannins/alcohol. It has quite a smooth mouth feel and persistent flavours of cassis and ripe red cherries whether you drink it upon opening or after decanting. From first sip, you get the cassis and ripe red cherries I mentioned, but there is also red currants, and hints of violets and milk chocolate. With decanting the floweriness and chocolate go away. On the finish you get red cherries, black fruit and vanilla, supported by medium plus tannins and mouthwatering acidity. A really elegant wine. Akarua Pinot Noir Bannockburn Central Otago 2012, New Zealand ($38.95) – I was told of the Central Otago region, Bannockburn produces the finest Pinot Noir. Smoky cherries and raspberry aromas. Medium body, with nice red cherry flavour, sweet and peppery spices, and light tannins. This wine is a step up in quality compared to the RUA, but both are very good. El Porvenir de Cafayate Laborum Tannat 2013, Argentina ($34.99) – Another surprise from Salta. Super inky garnet/ruby in the glass. A bit of a ganja smell, together with tea leaves, smokiness and dark fruit. Fuller body, silky with some minerality and ripe, softer tannins. Intense dark fruit together with some smokiness and pepper. A powerful wine. Barda Pinot Noir 2013, Argentina ($33.69) – Metaphorically traveling down to Patagonia, we tried two cooler climate Pinot Noir. This one I quite enjoyed, Pale garnet in colour. Nice nose consisting of sweet red cherries, smoked & dried orange, and a hint of flowers. Medium minus body, dry and soft. More flowers and orange on the palate, together with tea leaves. Medium plus acidity and very light tannins. A pretty wine. 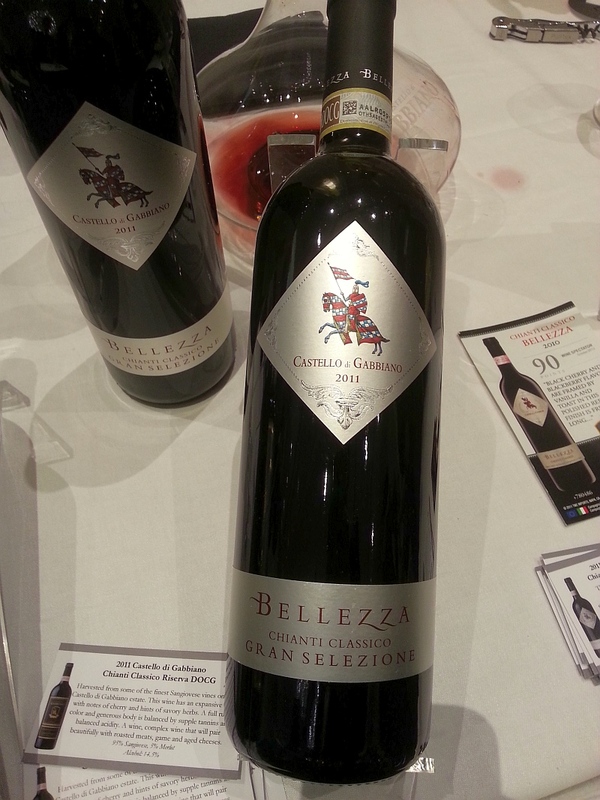 Castello di Gabbiano Chianti Classico DOCG Gran Selezione Bellezza 2011, Italy – 100% Sangiovese. Light cedar and vanilla nose. Medium body with round mouthfeel. Ripe red cherries followed by cedar and vanilla. Tastes very rich in your mouth.Drying tannins on the finish. Principe Corsini – Villa Le Corti Chianti Classico DOCG Gran Selezione Don Tommaso 2010, Italy – 80% Sangiovese and 20% Merlot. Light intensity nose of vanilla and cherries. Medium plus body, soft and round, with flavours of ripe cherries, sweet spices and vanilla. Tannins kick in mid plate. Peppery finish. Nice. Castello di Cacchiano Chianti Classico DOCG Castello di Cacchiano 2009, Italy – 95% Sangiovese, 5% Canaiolo, Malvasia Nera and Colorino. Restrained fruit nose. Fuller bodied with pronounced minerality. Medium acidity and fine tannins. Fruit forward with ripe, dark fruits and a hint of vanilla. Peppery finish.